UPDATE (3/20/09): Noah's just announced that it will be the official pretzel vendor for both the Washington Nationals and Baltimore Orioles baseball teams, and will have gluten-free pretzels available for all home games for those teams. Given that soft pretzels are an iconic part of Philadelphia's food culture, it is ironic that there are no bakeries in the area that make gluten-free pretzels. So we were happy to learn two years ago that a small company in Maryland had opened a store featuring gluten-free soft pretzels at a mall in Gaithersburg, where my brother lives. On the way back from a long Memorial Day weekend in 2008, we stopped at Noah's Pretzels in the Lakeforest Mall and enjoyed hot soft pretzels for the first time. We brought a few back with us and kept them in the freezer for reheating later. Since then, Noah's has begun to offer its gluten-free (and casein-free) pretzels through online ordering. I'm aware of two other companies, a bit closer to the Delaware Valley, that also ship gluten-free soft pretzels. 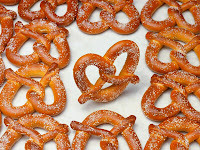 One is Dutch Country Soft Pretzels in New Holland, Pennsylvania, which sells mixes as well as pre-baked twists. The other is the Gluten Free Bagel Company in Meshoppen, Pennsylvania. As we haven't tried either of those companies' pretzels, I'm interested to know from readers if these are worth ordering. There are two of us with Celiac in our family and after hearing about the Dutch Country Soft Pretzels in New Holland, we decided to drive out there and check it out. The pretzels are AWESOME!! The GF pretzels are stored in a freezer that customers have access to. To save money, we actually bought a bag of "seconds", they were a bit mishapen, but who cares about that if they taste good!! It was only 5 bucks for a bag of 6 large soft pretzels. This little shop is located about 5 miles or so from the Shady Maple Smorgasbord...if you're familiar with the area at all. We plan on buying a few bags the next time to make it worth the drive. Definitely a great gf product...they're about as close as we're going to get to the wheat version.